Instead of focusing on PJs and slippers for this Pancakes and Pajamas party, I decided to try something different and give it a night time inspired spin with clouds, stars, and a giant moon balloon. I also wanted to create something that felt simple enough to inspire a special family celebration at home, yet festive enough to work into a full-blown birthday party too. 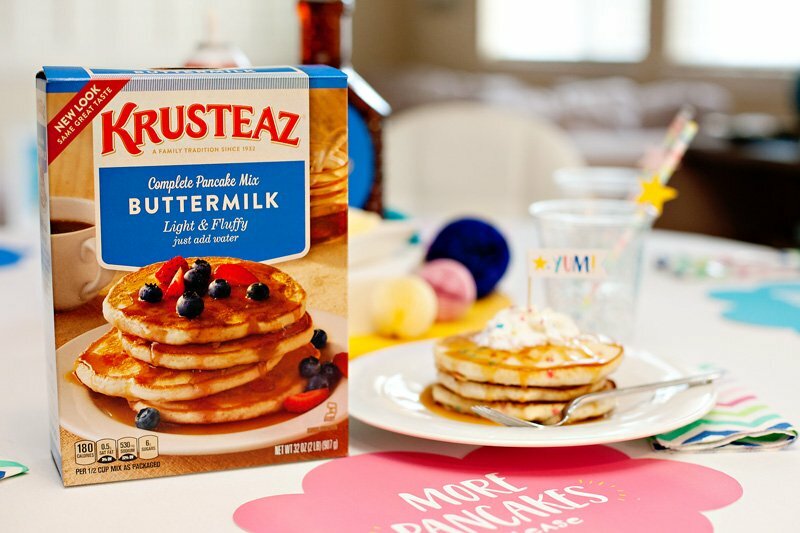 This meant quick decor, easy pancakes, and my favorite go to “secret ingredient” – party printables! You can find download links for the free printables after the images below, along with my 5 step breakdown of how to recreate this look. 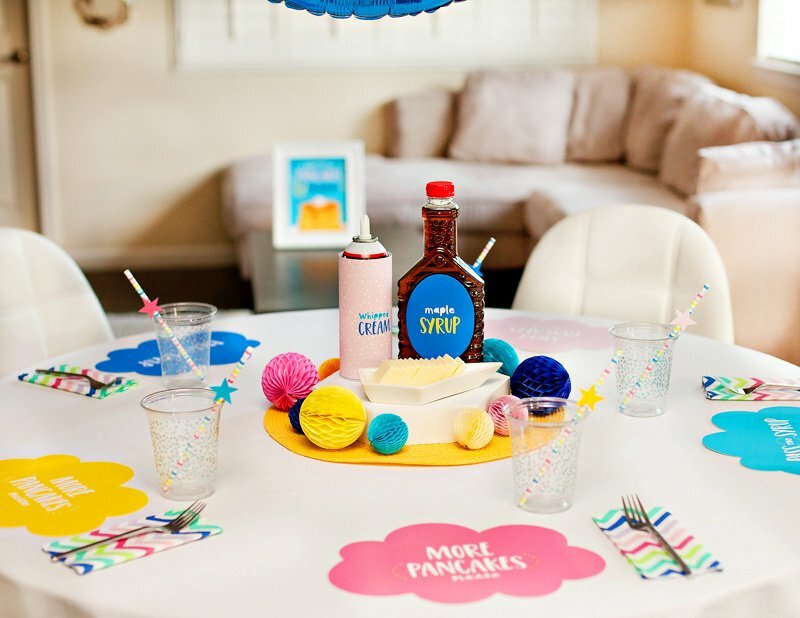 The party table features playful cloud-shaped printable “placemats”, honeycomb balls, and pancake toppings with custom labels. Hanging above the table: a giant crescent moon + more honeycomb decorations. Colorful cups, napkins, and straws are an easy way to add fun patterns to the table. 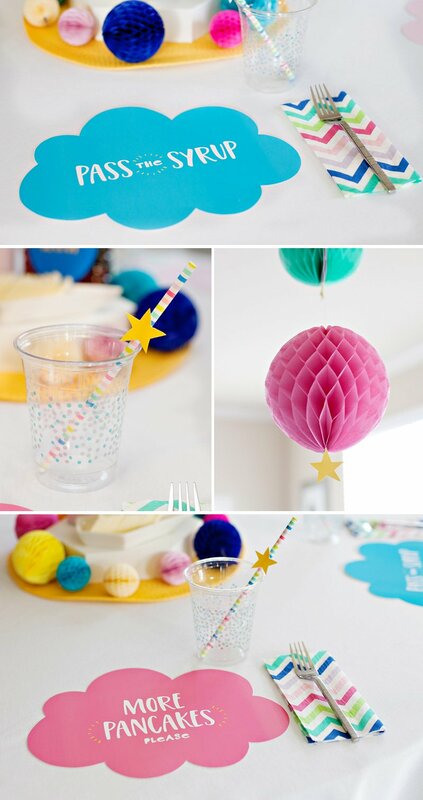 I purchased all of this partyware at Target and embellished the straws with printable stars. 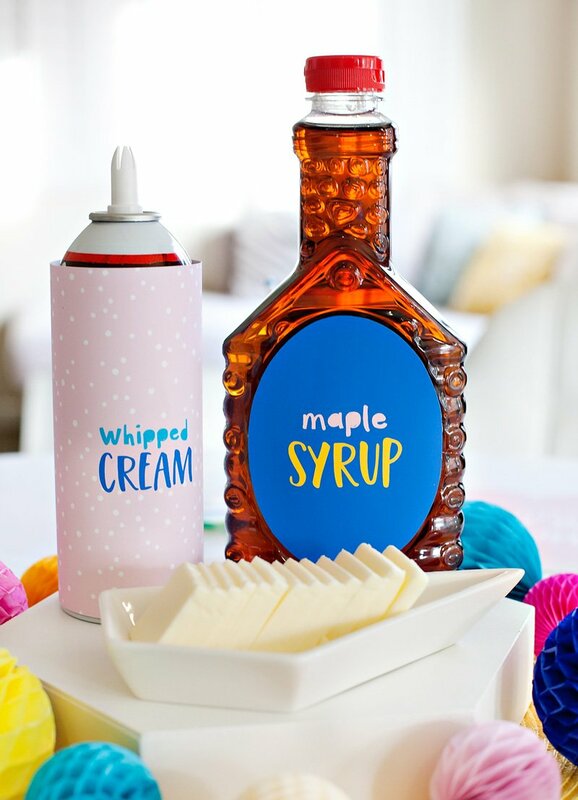 Pancake toppings + new labels = a cute & functional centerpiece! 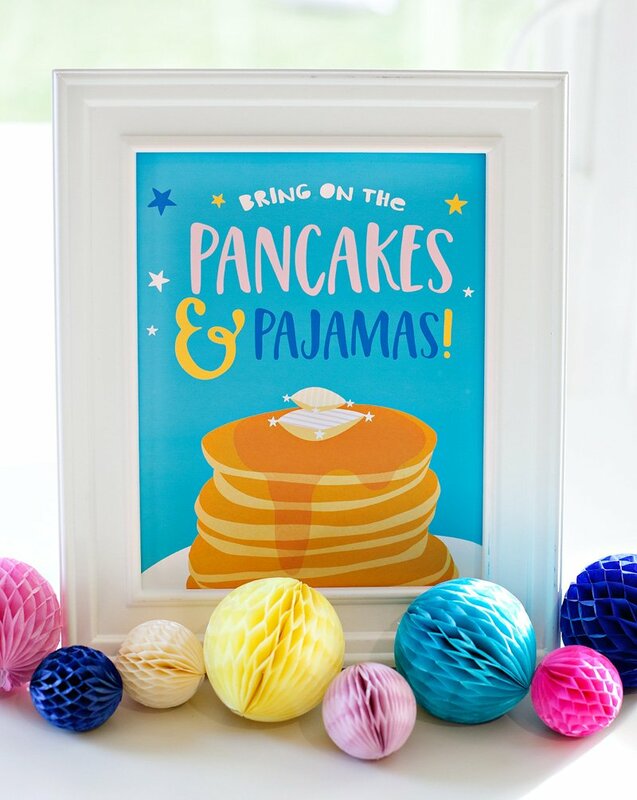 I love adding words to placemats… this printable set comes with 5 colors and alternates between “PASS the SYRUP” and “MORE PANCAKES please”. 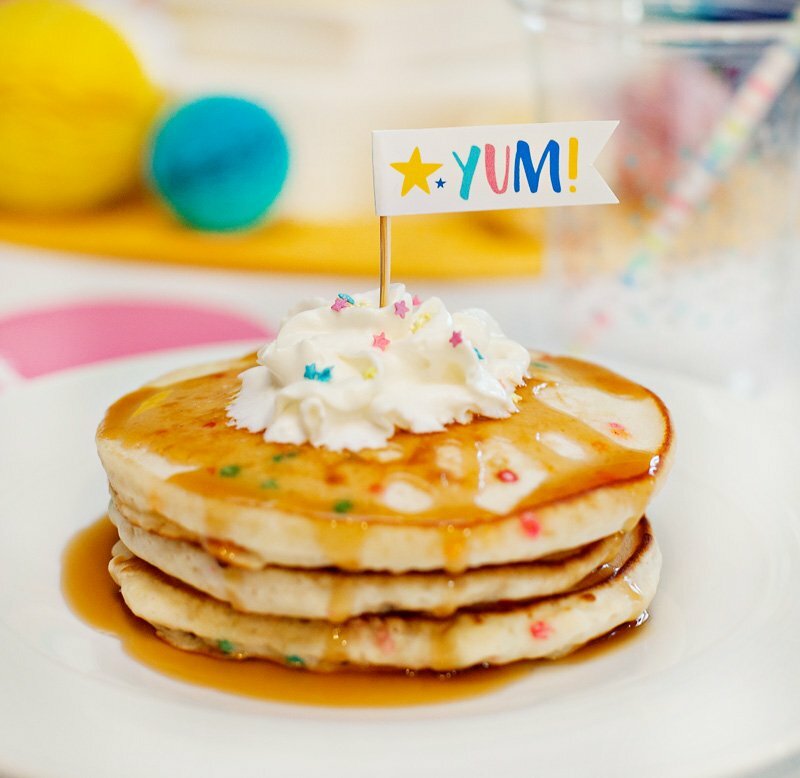 Here’s a closer look at the funfetti pancakes. Note: If you want to get even fancier, you can also add simple patterns and colors to your pancakes using the method I demonstrated here. 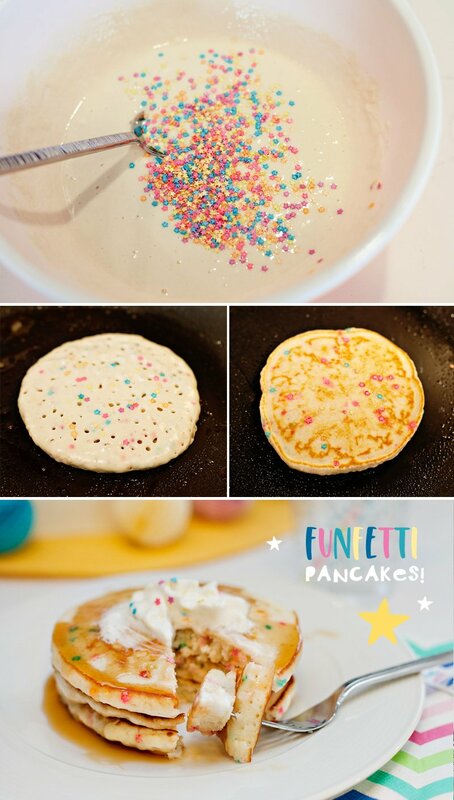 The image above is proof that even a simple addition can make pancakes SUPER FUN! 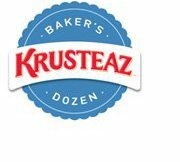 My own kids were so excited about these. It’s amazing how much joy “fun food” can stir up! Set the tone for a fun party with big pops of color at each place setting. 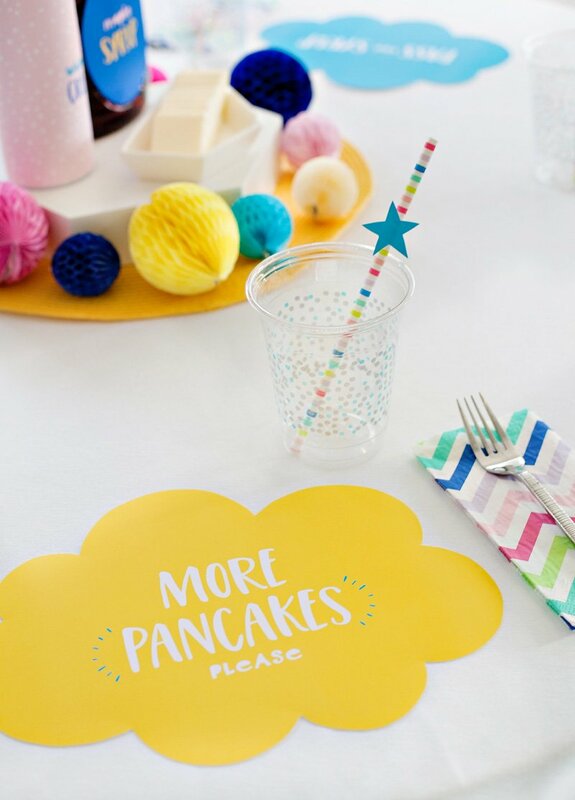 Add cloud-silhouette placemats + colorful napkins and straws. Hot glue paper stars to the straws. Easy, high-impact decor is the BEST… and this giant crescent moon balloon is exactly that. Just fill it with air and using fishing wire to hang it above your party table. Instant statement-maker in a just a few minutes! These inexpensive tissue decorations are another favorite ingredient for fast and high-impact. Just open up small honeycomb balls and toss them around the center of the table. 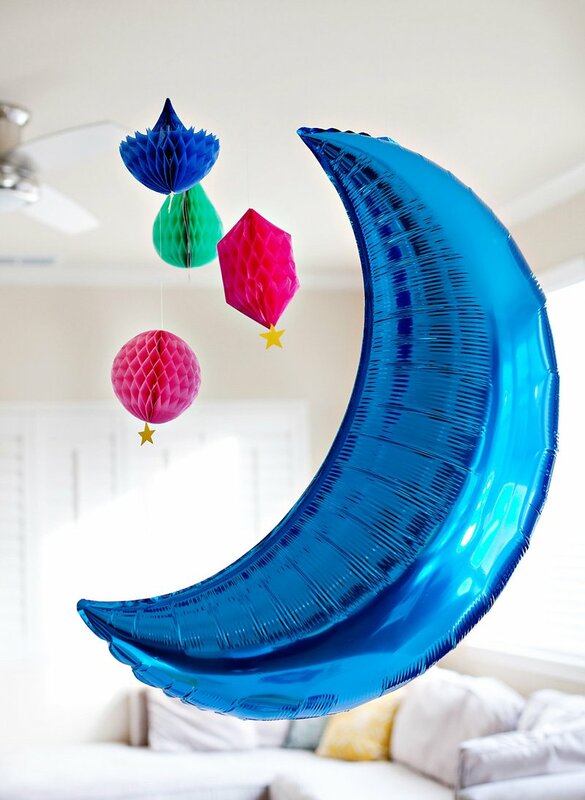 Hang a few next to the moon balloon for added color above the table, and hot glue little stars to them to play up the night sky theme. And of course this tip kind of goes with out saying… but make sure everyone comes in their PJs! To customize this design for a birthday party, I’d recommend adding chipboard or metallic balloon numbers (for the birthday age) and letters (for the guest of honor’s name) to the decorations. 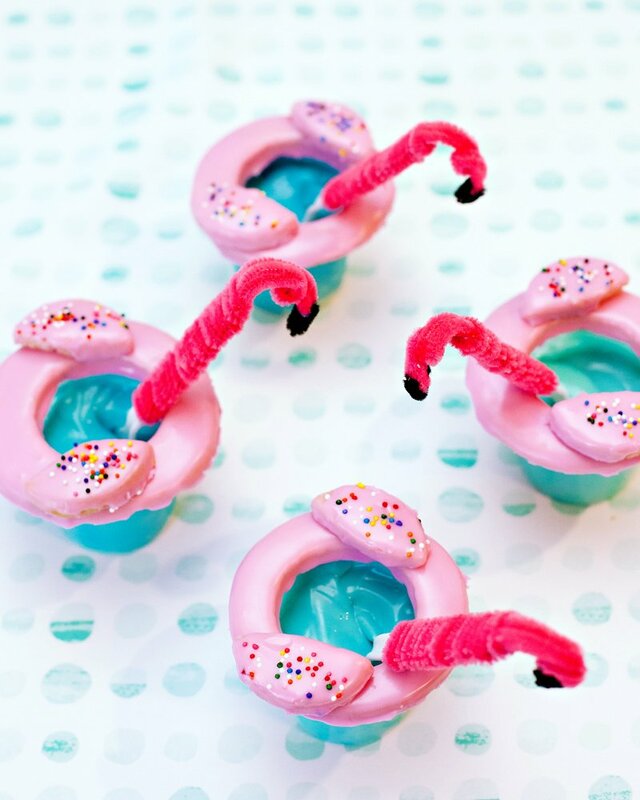 this is such an adorable idea!!!! I love it!!! Are there any printable invitations that go along with it or even better CUSTOM invitations?